Solar cars use photovoltaic cells (PV cells) that convert sunlight into electricity. The electricity fuels the car battery. Although a completely solar powered car is not yet available to the general public, people have been making their own versions for many years. Ed Passerin’s “Bluebird” (built in 1977), is acknowledged as the first totally solar powered car. 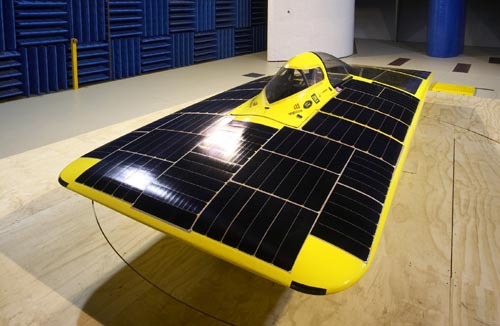 How practical would it be for you to get a one hundred percent solar car? At the moment, not very. The amount of power needed to run the car is limited by the area that can be exposed to sunlight. Also, the creation of solar cells is not cheap (although prices are declining). 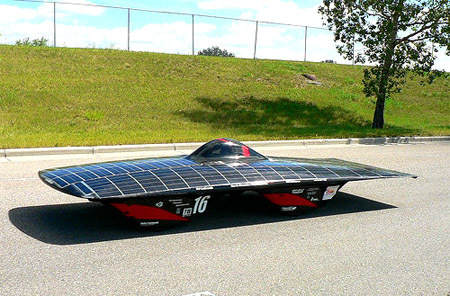 Completely solar powered cars are used in competitive racing. The American Solar Challenge is a yearly event where competitors design, build and race their own solar cars. These vehicles use thousands of solar cells to achieve speeds in excess of sixty miles per hour. They must be aerodynamically designed (and super light weight) to make up for their energy constraints. According to the website of another solar car race (the World Solar Challenge ) cars were “…able to reach speeds between 70 and 150 kilometers per hour (45 to 90 miles per hour) while only using the same amount of wattage as a toaster uses. The cars normally weigh about as much as a conventional refrigerator.” These solar cars are not cheap. The University of Michigan Solar Car Team has designed their vehicle (called the “Quantum”) with a budget of 1.2 million. For the rest of you who might be interested in driving a solar car, there are options. The 2012 Toyota Prius uses solar panels to power the ventilation system. And while the electric hybrid 2011 Chevy Volt does not come equipped with solar panels, GM charges all their Volt batteries in a carport equipped with solar panels. In 2011, Ford teamed up with a company called SunPower to create a rooftop solar system. It is designed to recharge the Ford Focus EV’s battery and costs around $10,000.